Nine of the boxes whose contents were shredded pertained to county elections, including voter registration cards dating to the mid-1940s. Marshall County employees hauled 150 boxes of documents out of the Annex Building and supervised their shredding on Wednesday. 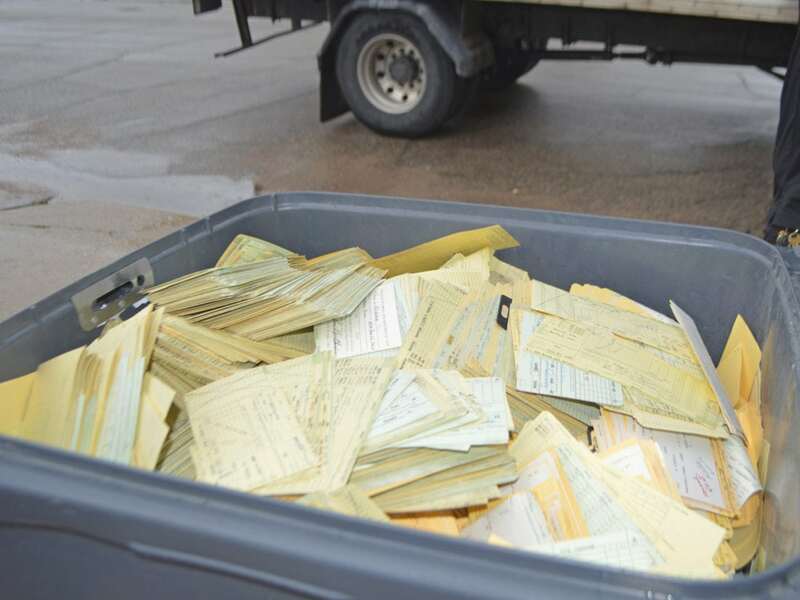 Over 6,000 pounds of materials were destroyed, ranging from time sheets, used and unused ballots, and court, accounting and engineering records — adhering to Iowa Code. Of those boxes, nine pertained to county elections, including voter registration cards dating to the mid-1940s from the building at 101 E. Main St.
Because some of these cards contained addresses and Social Security numbers, they had to be disposed of in a way that would not compromise a person’s privacy. Benson said all voter records dating back to 1985 are visible online. “Even into the 1980s and ’90s (the cards) were manually still being stamped even though things were being backed up electronically,” she said. Because the cards contained identifying information, Benson said, county employees had to visually watch the destruction of the materials. The papers and cards were pulverized at an angle to maximize efficiency, and will be disposed of by the shredding company, On-Site Information Destruction, Inc. The materials were piled into bins that then were loaded into the shredding truck, which was parked in front of the building. “The paper will go to be made into paper towels and toilet paper,” secure destruction specialist Craig Demaris said. Benson said getting rid of these boxes of papers is twofold: it helps clean out the Annex Building to prepare it for repairs from tornado damage, and it’s less paperwork to be stored at the Marshalltown Mall, where county materials are soon to be relocated, on a temporary basis. Wednesday afternoon, Marshall County employees hauled 150 boxes of documents out of the Annex Building, 101 E. Main St., and supervised their shredding, provided by On-Site Information Destruction, Inc. Over 6,000 pounds of materials were destroyed, ranging from time sheets, used and unused ballots, and court, accounting and engineering records — adhering to Iowa Code. Pictured is Secure Destruction Specialist Craig Demaris speaking with Marshall County Auditor/Recorder Nan Benson (center) and Assistant Auditor Cindy Reutzel.